Mayon Volcano has been the cause of heavy ash fall in the province of Albay. In the areas affected, residents were strongly advised to wear face masks and stay indoors to avoid respiratory complications. Camarines Sur’s Provincial Disaster Risk Reduction and Management Office (PDRRMO) distributed face masks to the municipalities affected. The volcanic ash not only is a health hazard but can also cause vehicular accidents in the area which could cause casualties because of the poor visibility. It was reported that in some part of the municipality of Guinobatan, the “abo” caused daytime to look like night time as it darkened the sky. Governor Al Francis Bichara shared photos on Facebook of the blackened sky and reminded everyone to stay indoors, wear facemasks or at least use a wet towel to cover the face and nose. 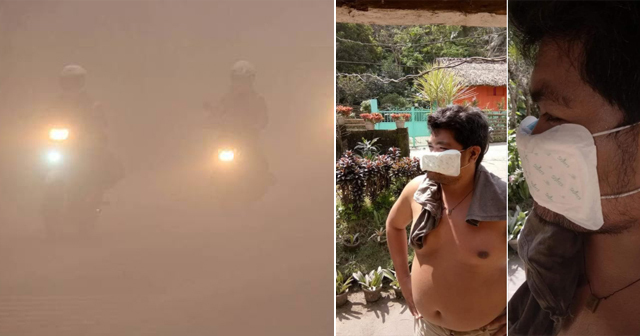 Despite the state of calamity in the province, we cannot help but notice a Facebook post of a netizen that introduced his friend’s improvised mask. Kay Kent Mortz, a resident in the province of Albay, posted a photo of his friend, Mark John Viray, using a sanitary napkin as a makeshift face mask after finding out that masks were completely sold out in their area. We cannot blame the local pharmacies because it was truly dangerous without a mask. In Mortz’ post, he said, “Since nagkaubusan na ng face mask, an improvised mask will do… look guys!!! Iba talaga ang Pinoy… MADISKARTE!!! Baka eto [ito] na ang next na mabenta sa mga tindahan… hehe, yan po si Mark John Viray… hehe.” He added a photo of Viray posing with the sanitary napkin that has thread attached on both sides, covering his nose and mouth. Given the circumstances in their region, it is admirable to discard honor for health safety. On another viewpoint, it’s the effort that people find ways to smile even if problems arise which is a definitely commendable trait of Filipinos. What do you think of the improvised face mask? Would you choose death before dishonor?